Slavery is bad, boys and girls. Globalisation is bad, boys and girls. 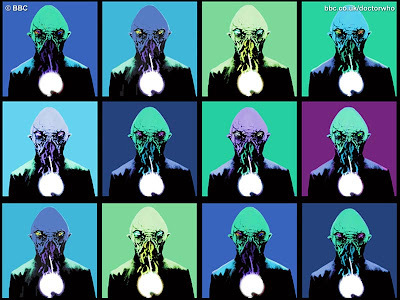 ‘Planet Of The Ood’ takes us back to the first principles of the classic series. Put a whacking great moral lesson in the middle of a bitter, bleak tale of science fiction imperialism and serve with fish-fingers and peas on Saturday. Doctor Who gives us a treatise on Milton Friedman’s supply side economics when you look at the journey of the Ood out of their ‘slavery’ towards ‘ freedom’ as an analogy to the struggles against the impositions of the free market. The Ood are reformist, co-operative might against the golden strait-jacket of the IMF or the World Bank. They’re like the Danish and the Norwegians refusing to accept the way the Euro has ripped down the edifice of worker protection rules and taxes that support the welfare state. Chuck in a few pops at imperialism and it’s like we’re watching ‘The Mutants’ all over again. Quite apt in the year of the 200th Anniversary of the abolition of slavery. Not that I’m against the series wearing its big leftist heart on its sleeve. It just seems so unfettered in ‘Planet Of The Ood’ as if suddenly Russell the lion tamer has let one of the big cats out of the cage. It's quite radical for a contemporary family tea-time show to try and address the audience’s own complicity in the cloak and dagger world of global economics whereas in the Letts era, anti-imperialist, pro-environmental themes arrived like an over-frequent bus service. Is this a sign then that the new series is getting much bolder in the way it reflects contemporary affairs? I hope so but then again this was like being bludgeoned a little too aggressively by Davies anti-totalitarian, progressive politics that runs through his reworking of the series. Love the message but not quite sure the messenger was being that subtle in delivering it. Subtlety is perhaps not something that could be employed, I suspect, when dealing with the emotive subject of slavery and, beyond the obvious visual symbols, – lines of Ood being whipped into submission – there is a more complex subtext bubbling away. The exchange between the Doctor and Donna about the Empire (obviously referring to both the British imperialist past and the USA’s imperialist agenda now) touches on Donna as representative of those coffee guzzling, Primark (other cheap clothes importers are available, readers) wearing members of the audience, clearly aware of the conditions under which their commodities were produced, who may well not want to hear the Doctor offering them 'holier than thou' cheap shots. And she goes on to argue that the Doctor could be accused of having human companions simply to provide him with a conscience. He's the 'Friends Of The Earth', 'Fairtrade' and 'Greenpeace' all rolled into one patronising moment and quite rightly Donna doesn't need lecturing when it is clear she recognises slavery on the Ood-Sphere for the wrong that it is and may at last be able to actively do something about it. It’s quite brave for an episode to feel the collar of the audience and suggest that in some ways we are all guilty of complicity in the way that the free market isn't fair on economies in China and India. The Empire is seen as a free market trading in Ood. These markets are about the flow of commodities in and out of galaxies without actually being of benefit to their respective economies. The money is being made outside of them. So, Halpern’s activities may well equate with the more dubious practices of the IMF and the World Bank. And if indeed an Ood revolution has taken place, as we are told by the conclusion of the episode, and all the Ood are returning to the Ood Sphere, then the story rather overlooks the down-side of this. The Empire will go to hell and probably suffer economic collapse. With the Ood out of slavery the Empire will surely seek a way to replace them? Doctor, is that a good thing? Do you want that on your conscience too? It’s too ‘feel good’ a solution to free the Ood and it raises more questions generally about the Doctor’s actions in what must eventually lead to the toppling of an Empire. The other problem with this story, which isn’t quite as radically cheeky as ‘Partners In Crime’ or emotionally gutsy as ‘The Fires Of Pompeii’, is the uneven tone. It’s clear that this is one of the first (if not the first) episodes in the filming block and Catherine Tate hasn’t quite got to grips with the character of Donna. The opening scene in the TARDIS and the subsequent landing are shrill in the same way that her flouncing around in a wedding dress was in ‘The Runaway Bride’ but later she seems to get to grips again with the subtler acting requirements when confronting the dying Ood in the snow. She’s also rather good when she asks the Doctor to allow her to hear the telepathic (protest) song of the Ood and her emotional response connects the audience to the moral battle being played out. She also continues to counter the Doctor’s flippancy, no more fittingly than in their little spat about imperialism and markets I discussed earlier. There are subtle touches of humour despite the bleak tone of the central message – the goofy Ood advertisement in the pre-credits, the handcuffs gag, the nod to 'The Simpsons' – that are then complemented by some good, kinetic action set pieces (director Graeme Harper’s forte) and nostalgic references to ‘The Sensorites’ as well as more mentions of missing bees and a note of foreshadowing for the Tenth Doctor in that ‘soon, your song will end’ coda. In keeping with the general themes of this series, once again we have a human being transformed into an alien, which now does seem like less of a coincidence and more of a continuing and developing idea. Tim McInnerny is suitably oily and ruthless as the low-grade IMF lackey, Halpern, and the whole mutation into an Ood is a bit of simplistic poetic justice, whilst scientifically dubious, and again is as near the knuckle as Doctor Constantine’s possession in ‘The Empty Child’ but perhaps not quite as effective. Still, it’ll have the kiddies freaking out over their baked beans. The notion of the Ood with their hind-brains is an interesting one but again don’t examine the evolutionary theory too closely. The hind-brain could be seen simply as another symbol of liberty and enlightenment and Halpern is transformed from ranting capitalist to a slave of the Ood holistic hive mind. Whilst the story opens up many questions, it is in itself reliant on some very SF, B movie tropes – the giant brain, telepathy, the base under siege – and whilst Harper’s direction works wonders this does feel a little flat, quite 'trad' in Doctor Who parlance, and even the ice planet environs verge on the unconvincing with some painfully obvious matte effects in some shots. Murray Gold's music strikes out in a different direction and adds some strange sounding tonalities that pleasingly seem to have wandered in, along with the moral message, from the classic series too. As an episode, it’s a strange mix of the traditional and the radical that doesn’t quite come off but at least they went back to the unanswered questions about the Ood’s origins that were left hanging in ‘The Impossible Planet’. How well they answered those questions is debatable but at least they tried.